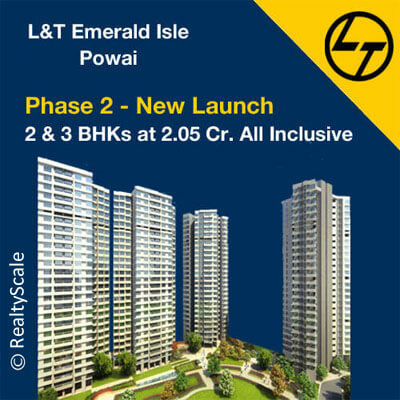 L&T Emerald Isle Powai by L&T Realty is a well-planned project. The project offers its residents an exquisite slice of high life with every characteristic design keeping them in mind. The project is located very close to the Powai lake, the project is a living space specially designed to help its residents so that they could cherish what they have worked hard to achieve. Emerald Isle Powai is created with the proper thought having state-of-the-art amenities and including the aim of accomplishing goals. L&T Emerald Isle in Powai with its unique feature idea and innovative techniques will get you fascinated. The excellent location of Powai, classy interiors, serene place, harmony pattern are certain traits that make this project a different one. With nature-efficient design gives you an opportunity to stay in a luxury apartment. The project has associated friendly space where the residents will find pleasure. Some other projects in Powai location include Kalpataru Woodsville and Vicinia Powai. The project is a residential marvel that redefines lavishness, sovereignty, and peace. If you had ever dreamt of being a bird, surrounded by peace and quietude, L&T Emerald Isle Powai is the ideal place for you to make your and your family’s dream abode. It is just five minutes from Hiranandani Gardens. The project at Powai is well connected throughout the city. It just ten minutes from Andheri. Twenty-five minutes from Chembur and twenty minutes from Mulund. The project is in close prox­im­ity to basic require­ments for their res­i­dents like hos­pi­tals, schools & restaurants. Emerald Isle Powai by L&T Realty pro­vides qual­ity and gives empha­sis to nature which makes their residents’ every­day more wonderful. L&T Realty is one of the best developers in the country, and when it comes to giving to their customers; they won’t fail, but exceed their customers’ expectations. This project L&T Emerald Isle at Powai that could change your lifestyle, if you are looking for new home for your happy family then this is the project to go for. L&T Realty is among the top developers in India of Larsen & Toubro. Its parent company, Larsen & Toubro has over 75 years of experience, L&T Realty has a very triumphant incursion into the real estate industry of India. L&T Realty has an extraordinary appearance in the Western and Southern India with various residential, commercial projects. The company is very dedicated to building milestones of excellence. Their best project in Mumbai is L&T Emerald Isle and L&T Crescent Bay. We're a Mumbai-based real estate firm who have extensive knowledge in real estates. We always strive for the best for all of our clients. We get many clients from USA, Dubai, Hong Kong, United Kingdom, Muscat. We specialize in Pre-Launch projects which are possible at extremely attractive rates before the official launch of several prominent projects. We give to our clients; exceptional rates available to us, gained through our hard work and reliability and we’re able to provide excellent rates during bulk bookings as they lead to more discounts.